Social media gives an ideal opportunity for small business advertising, as they can achieve excellent results at low cost. And the most powerful tool of it all – Facebook – gives tons of options to grow your business, especially with video ads. However, sometimes we fail. It happens to all of us. Even though we read all the possible blog posts about video optimisation, we research the ideal target audience, we write some compelling copy and we setup the ideal campaign, the results are just not what we expected. The road to being successful in Facebook advertising is not easy and require a lot of testing and failing before you achieve satisfying results, but thanks to these few tips, the way to achieve your goal will be much smoother and less painful. A/B-testing (or split testing) is a method of comparing two versions of your ad, to see which performs better. For video ads this could for example mean running two separate versions of the same video with different length, different music or alternative call-to-action. It is crucial to A/B test your video ads because you can compare its performance against each other and see what works best for your business and what your audience find the most compelling. When you see the results you can pick the video that performs better and test it again with another version. It might cost you a little bit more time and money at first, but it will be better for your business in the future. Let’s face it, people’s attention spans are short. According to studies, you only have 10 second to grab their interest. Make the most of it and bring your story to life quickly (ideally in the first 3 seconds) and compel your audience with fabulous videos, so they won’t scroll down through their News Feed. Although Facebook allows you to publish a 240 minutes long video, you should keep it much shorter. In fact, they recommend keeping it up to 15 seconds long for video ads. That makes sense as most people won’t watch longer than that. Studies show that the shorter the video is, the more likely people will watch it to the end, and as a result it might generate more interactions from the audience. This part is probably the most creative. Facebook offers a wide palette of options where you can target your ideal audience. Play along with it. But be patient, it can take some time to develop. You can begin with your own audience research or use custom audiences to make sure that the content you are offering will be most suited for the users. If your focus area is too small you can always expand it. Test a lot of possibilities and take advantage of Facebook targeting options to find out what is the best for your business. After you have run your first campaign you can create a lookalike audience or another custom audience based on video views. This will let you extend your targeting options and retarget users who has already engaged with your brand. We encourage you to play with your budget. You don’t need to break the bank to win the campaign though. Just a few adjustments can make a huge difference. Since February 2018, videos on Facebook autoplay with the sound on only if you tap on them. However, 85% of videos are played silently, so it’s essential to make sure that your video ads enhance viewers even with the sound turned off. Try adding captions, graphics and various colours to your videos, to ensure that your message is received by the audience even when the sound is muted. Facebook video ads are very effective ways to improve your business. Try to be creative, constantly improve and test as much as possible. Remember that failing is ok, we all do that, and we learn from our mistakes. By implementing these above-mentioned ideas into your next viral campaign it will most definitely boost your road to success. 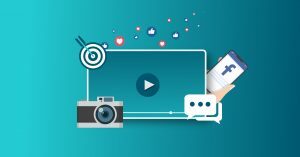 Newer Post Video Marketing Strategy 2019: Inbound Marketing and Video	Older Post How AI can impact your video marketing?